British men’s grooming brand Marram Co focuses on scent and its influence on mood as the prime marketing message for its new shaving creams. The eight shaving creams in Marram Co’s inaugural collection use different notes to alter the user’s state of mind in different ways. For instance, Time Out is aimed at men looking to unwind. It claims to reduce stress while cleansing, detoxifying and brightening tired skin. The brand harnesses the sensory properties of essential oils, using ingredients such as basil, thyme and cardamom to enhance relaxation. Essential oils are a growing market, forecast to reach $12.85bn globally by 2025 (Statistics MRC, 2017). With each of Marram Co’s shaving creams evoking a distinct olfactory experience, consumers are encouraged to experiment with the scents depending on their mood. With a tagline of “bringing pleasure to shaving”, the brand operates on a subscription basis. Each kit, containing a shaving cream of choice, is delivered every four, six or eight weeks. In a new multi-channel campaign, Porter Magazine is collaborating with environmental organisation Parley for the Oceans to raise awareness of plastic pollution. The magazine, which is published by luxury fashion e-tailer Net-A-Porter, is dedicating its summer issue to the oceans. It will contain a 63-page “Ocean Portfolio” shot in the Maldives, featuring model and Parley ambassador Anja Rubik. Editorials and interviews will explore the critical issues around ocean plastic and explain how readers can take matters into their own hands. The two-month campaign will see related content published on Porter.com and on social media under the hashtag #PlasticNotFantastic. Meanwhile, visitors to Net-A-Porter.com will be able to purchase items made from Parley’s own Ocean Plastic material, including an exclusive new eyewear range. Crucially, the magazine is showing long-term commitment to the cause by pledging to become plastic-free by 2019. It’s already taking steps towards this by dispatching its issues in recyclable paper envelopes, as well as making in-house changes like a ban on disposable plastic in the office and on its photo shoots. Porter is just one of a number of fashion industry players to collaborate with Parley, with Adidas, Stella McCartney and G-Star Raw all having previously partnered with the eco-warriors. Guys That Nail It is galantly reframing the beauty salon concept with a nail bar dedicated solely to men. The new British pop-up in London’s edgy Peckham district offers clients everything from classic pedicures through to more daring gel extensions. The launch of the nail bar hails the emergence of a new era of male beauty. The opening of Guys That Nail It signals the potential of beauty spaces and services dedicated to men, with 45% of parlours and 64% of mobile professionals in the UK currently not offering male grooming treatments (Beautiful Britain, 2017). British fashion label Stella McCartney is highlighting its environmental credentials with a new retail space that promises the cleanest air in London. The brand has collaborated with Airlabs to reduce shoppers’ exposure to air pollution. Airlabs has installed custom-made, nano-carbon filters into the store’s ventilation system, which clean more than 1,800 cubic metres of air per hour, with very low energy consumption. The ease and flexibility of the system means that such air cleaning could be scalable to other retail spaces or heavily-polluted regions. ‘Indoor air pollution is totally unregulated, and more research is urgently needed to assess the full cost to our health over a day, not just the pollution we breathe outdoors’, says Sophie Power, CEO and co-founder of Airlabs. Polish design student Roza Janusz has designed a new form of edible bio-packaging made from kombucha that can easily be produced by farmers to wrap their produce, allowing them to bring their products to market with zero waste. The designer claims that the concept could turn packaging production into an enriching benefit for the environment, rather than damaging it. Scoby (meaning the symbiotic culture of bacteria and yeast) is produced by adding sugars and other organic substances to kombucha, which is then left to ferment and develop a membrane skin on the top. This is removed after two weeks and forms the thin packaging sheets. The new material is vegetarian-friendly and completely biodegradable and has a long shelf-life thanks to its low PH. It has a light kombucha flavour on its own, but takes on the flavour of its contents when heated. Janusz has suggested that the material can be used to package a variety of foods, including fresh produce such as fruits and vegetables, herbs, seeds and even instant meals. British manufacturer Ronald Britton has created a plastic-free, biodegradable glitter for use in cosmetics. Cosmetic Bio-glitter Pure is made from a plant-based cellulose primarily derived from responsibly sourced eucalyptus. According to the company, the glitter can be used in any cosmetic product and is suitable for a range of dry, liquid or cream formulas. It also has the benefit of offering reflective and iridescent tones that are subtler than conventional glitter. A ban on the use of all microplastics in rinse-off cosmetics, including glitter and microbeads, came into force in the UK in January 2018, following bans in a number of other countries. Cosmetic Bio-glitter Pure is compliant with this new legislation and could set a new benchmark for eco-friendly glitter-based cosmetics. Canadian e-commerce fashion platform Ssense has opened an explorative bricks-and-mortar flagship in Montreal’s Old Town. Unveiled in May, the five storey, 13,000 sq st space blends online shopping with gallery-like installations to entertain and surprise consumers. Guests pre-select items to try on from more than 20,000 pieces available on Ssense’s website, and select an appointment time. In less than 24 hours, the garments are ready and waiting for them in one of the dressing rooms that occupy the entire third and fourth floors. Customers who haven’t pre-booked items can browse a limited selection of frequently refreshed clothing on the first floor as well as special artist collaborations on the second floor, which is also used as a performance space. The fifth floor houses a small bookstore stocked with art publications and a café serving coffee and snacks. London firm David Chipperfield Architects designed the interior with an on-brand, brutalist aesthetic – minimal decoration on dark grey stone walls creates a distraction-free shopping environment. American luxury start-up Milèo New York capitalises on the wellbeing trend by harnessing the healing properties of aromatherapy in a new sustainable skincare collection. The unisex range consists of four facial elixirs, which feature naturally occurring oud as the core ingredient. According to the brand, oud’s multifunctional properties regenerate skin cells and reduce inflammation – resulting in smooth and hydrated skin. Each elixir contains 48 botanical extracts, which aim to stimulate a sensorial experience wearer. The elixir Amber Fort, for instance, is a brightening facial oil that combines Indian pink lotus flower and Indian jasmine – known to promote relaxation. Milèo adapts the conventional use of fragrance to create evocative sensorial experiences for the skincare realm and feeds into a growing trend for reviving aromatherapy for the luxury sphere. To ensure the purity of the ingredients being used in its formulas, Milèo harnesses an innovative testing method called gas chromatography-mass spectrum analysis, which quantifies the time an ingredient was harvested and how it was distilled. As a result, only clean and ethically sourced ingredients – free from chemicals, pesticides and synthetic enhancements – touch the wearers’ skin. An eco-friendly strategy is key to engaging with young luxury consumers. Approximately 47% of millennials check whether high-end brands foster sustainable values before purchasing (Deloitte, 2017). A US-based company is hoping to inspire a new generation of beekeepers with wall-mounted hives that can be installed inside of outside buildings. Beecoystem’s modular HexHive boxes are for beekeeping beginners who want to learn about the importance of pollination and bee populations. The hives have been innovatively designed to take up minimal space, making them perfect for urban nature-lovers. HexHive boxes can be attached to any wall using a mounted bracket and a clear plug-in tube that runs between the modules and a specially designed window unit if the hive is situated indoors. Beekeepers can attach supplementary hexagonal modules to their original box, using the built-in magnetic connection points to expand their hive. To populate their HexHive, beekeepers will have to order worker bees and a newly mated queen from a packaged bees company that will ship directly to your door. A single HexHive box costs $599 and includes a wall mount, clear tubing and window unit. Customers can also buy a starter kit of beekeeping tools for $150. Ikea’s research and innovation lab Space 10 has devised a menu of five fast-food dishes that tackle issues surrounding the predicted world food crisis. Focusing on waste, obesity and scarcity, the menu includes The Dogless Hotdog – made with dried and glazed baby carrots, beet and berry ketchup, mustard and turmeric cream, roasted onions, cucumber and a herb salad mix in a high-protein spirulina bun. Meanwhile, the Big Burger patty is made from beetroot, parsnip, potatoes and mealworms and comes with relish, beetroot and blackcurrant ketchup, chive spread and a hydroponic salad mix. 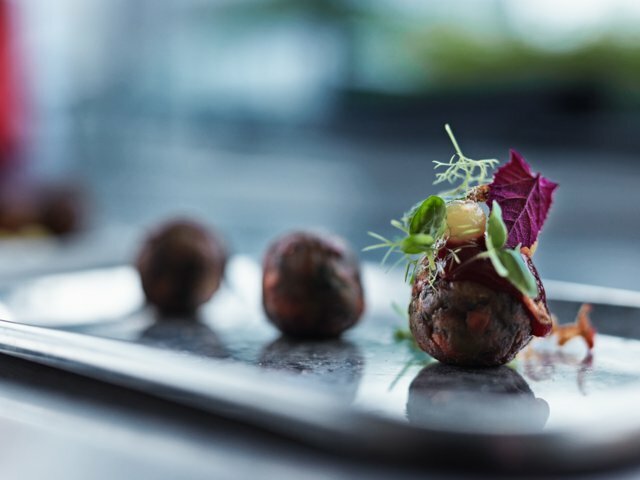 There’s also meatballs made from mealworms and root vegetables, a hydroponically grown salad served with day-old bread to minimise food waste, and an ice cream made with microgreens such as mint and sorrel to create a frozen treat that is low in sugar and calories. A new glass which generates sound – created by Japanese glass technology firm AGC Asahi Glass – was among the material innovations unveiled at Milan Design Week 2018. An ethereal soundscape designed in collaboration with Japanese architect Motosuke Mandai was installed within the vaults of Milan Central Station to showcase the discreet technology. The material, currently under development at AGC, uses a new type of laminated glass that's been manufactured to emit clear sound rather than the usual characteristics of glass such as resonance and reverberations. Soundscape features shards of glass suspended from the ceiling by metal rods. Each shard emits different sounds from nature, such as water droplets or rustling leaves. As users walk through the space, they experience a multi-layered auditory experience, where sounds can be sensed differently depending on where they are located in the exhibit.